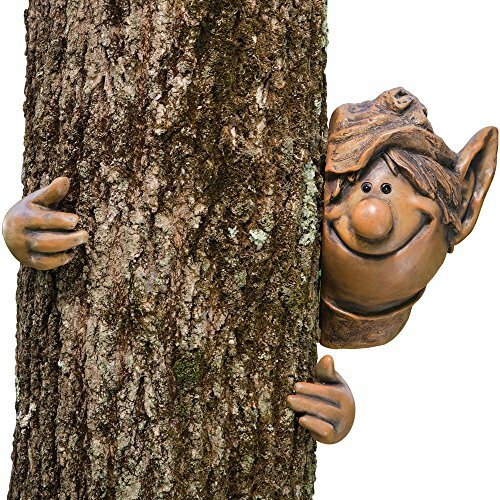 Garden Peeker is a large resin garden sculpture of an elf that looks like he is peeking out from behind a tree. Mount his face and hand on one side of a tree and place the other hand on the opposite side and he will appear to be grinning and peeking out from behind. Add some humor to the yard and surprise your guests with this garden decoration. Makes a great gag gift for the lawn. Crafted from weather resistant polyresin. Garden Peeker Face measures 5" x 7"
Let our Elf bring a cheerful greeting to all who visit your garden or yard. Garden Peeker Face measures 5" x 7"